To get information about battery, usage statistics and device. 2. Are Smart Phone Voice / SMS Transfers on? This combination of numbers and symbols allows you to understand where your mobile is Transferring Calls, SMS-es or other messages. If you type this code and click call the phone screen should show any numbers to which any data is being transferred, if your phone is okay and not tapped you will get a message the phone call transfers and sms transfer is disabled. 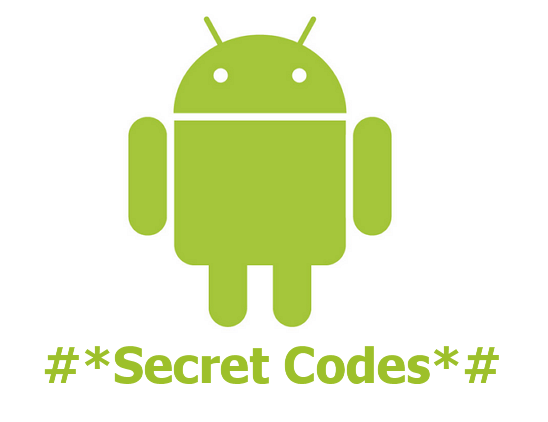 Always keep in mind that there is a danger for your info / data or even billings to be tapped already as Android is non-free software, so even if that code returns no transfers you're still insecure at the hands of Google's mercy. 3. Where are calls and SMS-es transffered in case if Voice / SMS Transfers are on? This codes shows where are your input Calls and SMS-es are being transferred once someone is calling you and he is unable to reach you. At best case the inbound calls will be redirected as voice mail format to voice mail box of the number of your mobile operator. By inputting above code you can deactivate all kind of redirects, which were prior configured at your mobile phone. 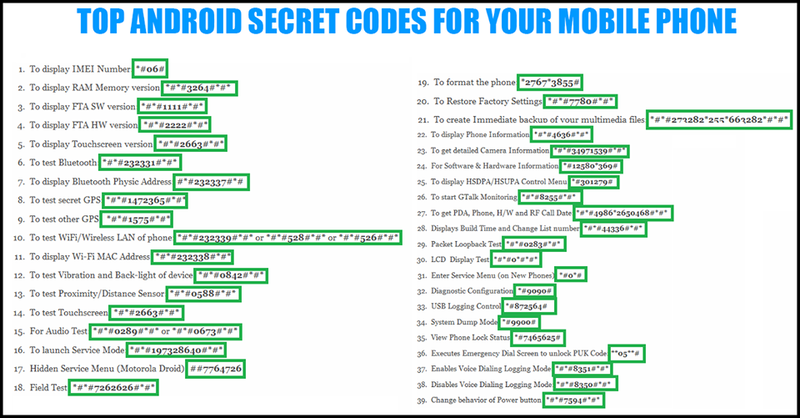 The code is universal one and should work not only in Android but across all smart phones including IPhones. It is a recommended one especially if you're planning to travel in foreign country or region due to the roaming phone expenses. Above code provides information about the ID number of the mobile phone th so called IMEI (International Mobile Equipment Identifier). Using the email a mobile phone that has been recently stolen can be easily found, because the device is emitting its IMEI number to the mobile phone operator, nomatter what kind of SIM Card is inserted in the phone. 6. How to protect yourself from criminals and spies? *#*#7780#*#* – Nullify phone settings.. Delete only applications. *2767*3855# – Nullify all settings, reinstall firmware. *34971539#*#* – Full information about phone camera vendor etc.